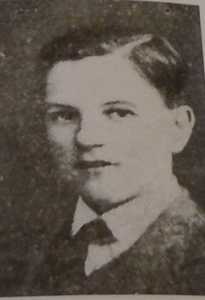 Richard was born on 13 September 1896, at Clifton, Lancashire. (Baptised 15 October 1896 at United Methodist Free Church, Happy Land, Dumbell Street, Pendlebury, Manchester.) 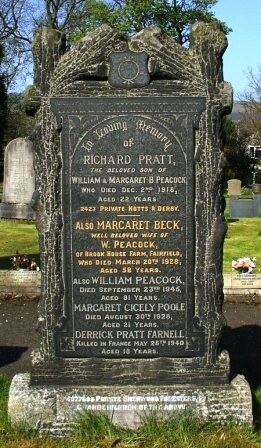 He was the son of William (Dairyman) and Margaret Beck (née Bennett) Peacock. He had three older siblings, Mabel Mary (see: Footnote below), Jane Beck and John William, and three younger, Kate Annie, Tom Taylor and Dora Margaret, and in 1901 (Census RG 13/3657) the family were living at 69 Bolton Road, Clifton, Lancashire. Ten years later (1911 Census RG 14/) Richard's father had bought a farm - Hargate Wall Farm, Wormhill, Buxton, and employing two servants. After the War his parents had moved again to Brook House Farm, Buxton. At the time of his enlistment Richard was living at Long Hill Farm, Buxton, and employed as a "Bank Clerk". He was 5 ft. 3¼ ins. (1.61 m) tall, had blue eyes, brown hair and a 'fresh' complexion. He gave his religion as 'Primitive Methodist'. Richard enlisted at Buxton on the 6th October 1914 into the 1st/6th Battalion of Notts and Derby Regiment, the local Territorial Force, no doubt joining "C" Company, under Capt. E. H. Heathcote. 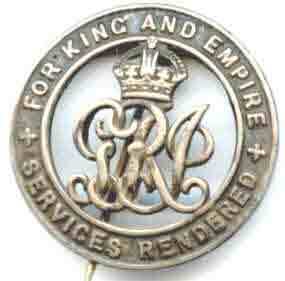 After initial training in Luton and Harpenden, the Battalion went on in November 1914 to Braintree, forming part of Notts. & Derby Brigade in the North Midland Division. Soon after midnight on the 24th the Battalion left Braintree by train and sailed from Southampton on the 25th, 'A' and 'B' Companies on HMT Maidan, and Richard's 'C' Company on the King Edward. His Service Papers show that Richard sailed from Southampton and entered France at Le Havre on 28th February 1915 along with 547 other Officers and men. Eight weeks after entering France Richard became ill "in the field", on the 4th May 1915, at Kemmel, Belgium. The following day he was admitted to No. 2 Casualty Clearing Station, at Bailleul, then, on the 8th admitted to No. 1 Stationery Hospital at Rouen, suffering from "Rheumatism" - later diagnosed as "Rheumatic Fever". On the 14th May Richard was "Transferred to Ambulance Train for England". However, Richard died at home before his next Board was scheduled and he was buried in a family grave in his local churchyard of St Peter's Church, Fairfield. Later his parents and other relations were buried with him. The gravestone also commemorates his nephew (see: Footnote below). When reporting his death and funeral 'The Buxton Advertiser' wrote that Richard had: "... served 2 years in the Army before being discharged. 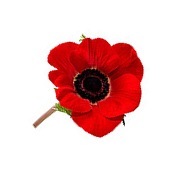 He enlisted on 6th October 1914 and landed in France on the 28th February 1915. He was discharged on the 14th April 1916 and died on Monday, 2nd December 1918 as a result of an attack of pneumonia, which came as a surprise and a blow." It went on to report that Richard had spent many happy hours in weeks gone by in the Comrades Club in Spring Gardens. His funeral was with full military honours on the 5th December and crowds waited at the top of Fairfield Road. The Band of the Canadian Discharge Depot played. France. He was the son of Richard's sister, Mabel Mary and William Henry Farnell. Oignies Cemetery eventually led to the two towns becoming twinned.